Do you have a friend, relative, or former classmate that you think is worthy of being inducted into the Washburn High School Athletic Hall of Fame? If so, here’s your chance to nominate that individual(s). 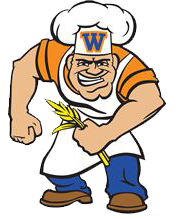 Many qualified individuals have played an important role in the history of Washburn High School Athletics – athletes, coaches, and individuals from the community have all played a significant role in the promotion of athletics at Washburn. The Washburn Athletic Hall of Fame was formed to recognize and pay tribute to these outstanding individuals. Nominations can be submitted at any time throughout the year. Those nominations received prior to January 1st will be considered during that upcoming selection of candidates. Nominations remain on file indefinitely. Please do not assume that someone has already been nominated, or that the Selection Committee has already received sufficient information about these individuals. The more history, stats, and facts that can be added to what may already be on file will serve to provide that additional insight that the Selection Committee may need when making their decisions. To be eligible, an athlete must have participated in athletics while attending Washburn High School. The candidate must have graduated from Washburn High School a minimum of twenty (20) years prior to his/her nomination. The candidate must, during and following his/her career, have exemplified the attitude and conduct that is a credit to Washburn High School . Was a statistical leader or a record holder in a selected sport. The candidate must have completed coaching at Washburn High School at least five (5) years prior to nomination. Was instrumental in building a successful athletic program. Any person who has made a significant and continuing contribution toward promoting athletics at Washburn High School.